The Childers Group is committed to the long-term viability and vitality of the arts. A key part of our role is advocating support for the arts to governments at all levels, and to engage with the private sector, educators, the media and the broader community about the value of the arts and their role in the cultural sector. Next month finds the group hosting their first public forum – a ‘facilitated conversation pit’ featuring five guest speakers a facilitator of note. Imagine my delight and then delayed terror at having been invited to be one of this five, alongside Centenary of Canberra Creative Directive Robyn Archer, Opposition arts spokesperson Vicki Dunne, Greens arts spokesperson Caroline Le Couteur and urban poet Omar Musa. As it is a public forum, you’re invited to come along and get involved. 5 for 5:30pm, Wednesday April 18 at The Street Theatre. Please note RSVP details in the invite below. Take the time to read more about the Childers Group and the fine talents behind their endeavours at their site, and hope to see you at the forum! 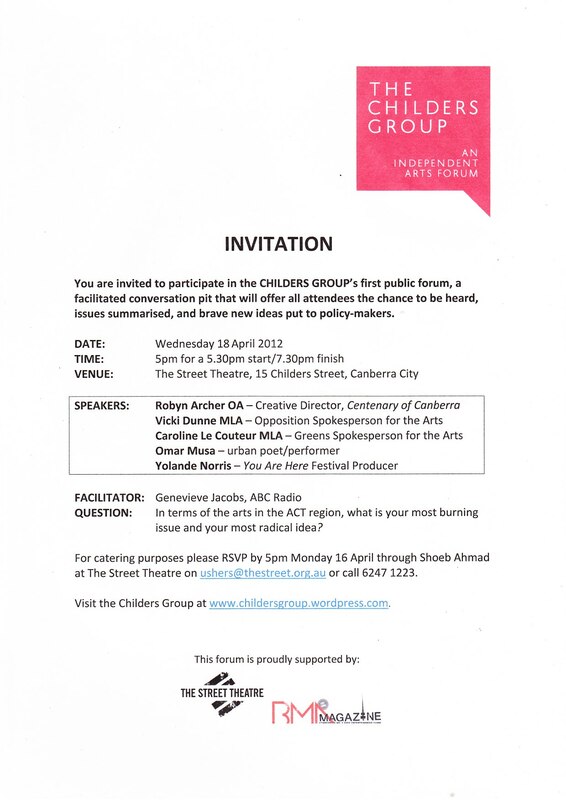 I attended the Childers Group Forum last night. I was very disappointed and left before it ended. The organisation was abysmal. Seating would-be attenders on the Street Theatre stage was a serious error. There was clearly not room for them there. And there was NO handicapped access. The speakers should have been on the stage facing the attenders in the auditorium. That’s what the acoustics of a theatre are designed for. The MC did not insist that those who spoke were required to stand, so their voices were mostly absorbed by the seated crowd. Many of them spoke with their back to the audience. Microphones for the speaker and the makers of comments from the attenders were essential, but not provided. In the front row of the auditorium, I could hear less than half of what was being said on the stage. The politicians, whom one would expect to be able to project their voices, even if they are not actors, were as unintelligible as the rest. The format of the forum was poorly planned and badly executed. This does not augur well for a successful public or artists’ attempt improve the impact and presence of the Arts in Canberra. I was disappointed that after so much hype, the simple presentation of a forum seemed to be beyond the abilities of the organisers. Perhaps they should have consulted the theatre community for the best way to speak to an audience in a theatre.